Our expansive showroom is located in Raynham, Massachusetts. Come in and see the latest in styles and features — touch and feel the difference in the various brands and styles. Nothing can replace the hands-on experience when selecting the right cabinets for you. 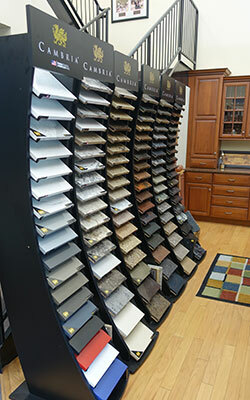 We have 100's of samples of cabinets,counter-tops and hardware to help you select the right materials for your job. We also have many installations of the many products we offer. Let our expert sales and design staff guide you through the the design of your project. Visit us during our normal business hours, or call for an appointment at a time more convenient for you. The showroom is conveniently located on Route 138 in Raynham. Minutes from Routes 24 & 495, the showroom is easily accessible from the South Shore, Cape Cod, and Rhode Island. CLICK HERE for directions.